Skiers from around the world are choosing to ski the award winning Blizzard skis as their go-to ski of choice for everything from the Freeride World Tour Champion to everyday fun seekers who shred just as hard. With a collection that covers every aspect of skiing that has resulted in the world’s best-selling freeride skis and all mountain skis and are improved once again and primed to crush the 2018/19 ski season. Athletes and testers rave that Blizzard skis with their legendary Carbon Flipcore and two sheets of metal, outperform other all-mountain skis in any condition from powder to groomers. The Rustler series lets you rip on any terrain with confidence, while the Quattro represents the world’s most technologically advanced collection of high performance skis specifically designed to carve the perfect turn on groomed snow. The Bushwacker with Carbon Drive is lighter and easier than ever providing precise, smooth and pure exhilaration and features a shape that makes them calm, confident and easier to ski. 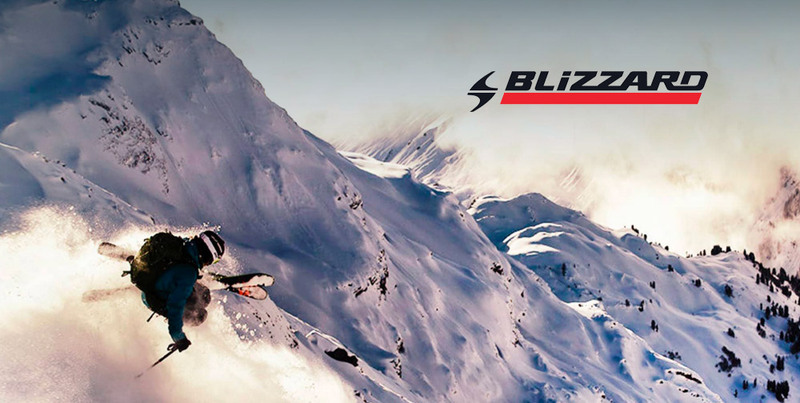 Blizzard skis in their never ending quest to improve the skiing experience has added the next generation of Carbon Spine technology. C-Spine is enhances rebound and energy saving your legs energy for driving into the next turn. Other key design elements of Blizzard include the, IQ shape and rocker that give their skis the perfect balance between stability and control. With a 102 wasite width my people find the Rustler 10 to be the ideal ski whatever the conditions. Built on two signature Blizzard concepts including; first Carbon Flipcore D.R.T Technology a revolutionary rockered ski production process that incorporates a specifically designed piece of Titanal, which reduces the torsional strength of the tip and tail areas of the ski while adding stability and control underfoot. Second, an innovative waist concept that the longer the ski, the wider the waist which gives freeriders and all mountain skiers more versatility and float. The smooth rocker-camber-rocker profile makes the Rustler 10 a responsive and stable ski that retains a playful characteristic in soft snow. The Rustler 10 is the one-ski quiver choice of advanced freeride skiers for their Aspen ski rental. If you are looking for a freeride ski made to cover the entire mountain with a slimmer profile that lends itself more to packed powder conditions the Rustler 9 is it! With Blizzards Carbon Flipcore D.R.T Technology and an innovative waist concept where the longer the ski, the wider the waist the ski makes precision turns even on steep terrain. The smooth rocker-camber-rocker profile is specifically designed with tip and tail camber that increases the carving character on groomed trails without sacrificing flotation on fresh snow. Put this altogether and you get a responsive and stable ski that is really playful in all snow conditions. Stop in the ski shop for the Rustler 9 for a ski that works well on all the terrain Aspen Mountain has to offer. The Brahma is an Aspen locals choice of a freeride ski on days when the cold temps and dry spells make for firmer snow conditions and the focus is on ripping groomers and bashing bumps. With a versatile sidecut made for carving and reduced rocker profile that does not get hung up in the moguls this ski is ideal for these kind of conditions. Two sheets of metal smooths the ride, grips hard snow and gives these skis the power needed to blast through variable snow. At 88mm underfoot, the super versatile Brahma puts the fun into every type of snow condition and terrain the mountain has to offer. The Brahma is your Aspen rental ski when it has not snowed in a few days and you want to work on perfecting your turns all over the mountain. The Sheeva 9 is an all-mountain female specific freeride ski that begs to be used all over the mountain. The women’s specific design provides the perfect balance for lighter skiers and reduced weight that requires less force to drive, both of which improve performance for female skiers. The smooth rocker-camber-rocker profile on a 90 mm waist make the Sheva responsive while the naturally strong and lightweight wood core are strategically constructed for maximum performance while reducing weight. The Sheeva 9 is a great choice of ski rental for Aspen Mountain for intermediate to expert female skiers. As the world’s best selling women’s ski with awards this year from Ski Magazine, Mountain and Real Skiers you may want to make a point of taking these out from the ski shop for a demo one day. These sticks have made a name for themselves as the versatile, all-around ski with the ultimate ride through all types of terrain from the steep fall line of Walshes to the perfectly shaped moguls on Bell Mountain. With an 88 mm waist, and a women’s specific Carbon Flipcore W.S.D. construction they perform on groomers, in the trees, through bumps and on fresh snow up to about six inches. The lightweight wood core construction set with early rise tip and tail make this ski want to turn. While the camber underfoot give it power for ripping female skiers that are dominating the mountain today. With many World Cup ski races held on Aspen Mountain it is no secret that it has excellent terrain for caring carving fast turns. And with the mountain being groomed every night you are going to want a ski that can take advantage of this combination of fast terrain and perfect conditions, if this get you excited then Blizzard’s Firebird Race Ti is the ski rental for you. This World Cup inspired ski is a distinctly lively model designed for advanced skiers who like carving tight-to-medium radius turns on-piste. With the addition of the FDT Race plate and layer of Titanal, the Race Ti has a powerful and smooth ride that allows you to feel in control at extremely high speeds. Full sidewalls provide torsional rigidity and constant pressure along the full length of the ski that make you feel confident on any slope no matter how hard or fast the snow may be.